Another key factor for your web site’s standing with the search engines is the linked text on your web page. You need to put careful thought into the text you are linking to and what will best identify these links, while also incorporating your keywords if possible. The optimal case is creating links with anchor points (the text within the link) containing your keywords. 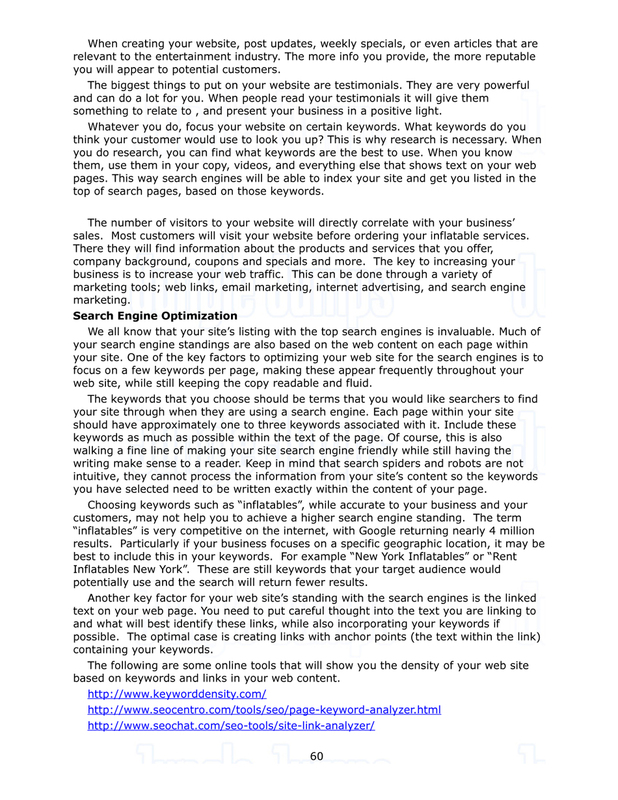 The following are some online tools that will show you the density of your web site based on keywords and links in your web content.http://www.keyworddensity.com/http://www.seocentro.com/tools/seo/page-keyword-analyzer.htmlhttp://www.seochat.com/seo-tools/site-link-analyzer/Search engine optimization is by no means an exact science. With the search engines continuously modifying and tweaking their algorithms it is difficult for a company to keep up. One of the other key factors for search engines is the longevity of your site. Sites that have been online for many years have a better standing with the search engines. Clearly, this is not something that you can fabricate, but only gain through time. Because of this it is important that once established you do not change your URL, because doing so will put you back to square one with the search engines.Search Engine MarketingA great, and relatively inexpensive, marketing tool for your business is search engine marketing. These are pay-per-click ads displayed by search engines when the keywords that you have selected are searched for. These ads generally appear at the top of the search results or in the right column under the heading “Sponsored Links”. The two biggest players in pay-per-click ads are Google Adwords and (Yahoo and MSN search engines).http://adwords.google.comhttp://advertise.bingads.microsoft.com/en-us/sign-upVisit the sites above to set up and begin running your search ads. The first step to setting up your business’ search engine ads is to determine the most relevant keywords for your inflatable business. These are terms that potential customers would be searching for; inflatables, bounce houses, bouncers, etc. It is also a good idea to include the geographic location (city and / or state) in the keywords. You will then go step-by-step through the process of writing the ad that will appear. When you choose a heading try to create something that will grab the viewer’s attention. You will then enter the text that will follow the heading and a URL that the ad will be directed to. This can be the home page of your web site or a more specific page within the site that elaborates more specifically on the product or service that they were searching for.During the setup process you will also have the opportunity to specify when you want your ad to appear. You can select a particular geographic location as specific as city and state. Your ad will only be shown to searchers in that area. This is very key targeting for the inflatable business, and will save you money in the long run by only showing your ad to potential customers in your business area.Once your ad is up and running you will be charged based on how many times the ad is clicked on by viewers. This means you only pay for visitors that are directed to your web site. The cost of these clicks is determined by the popularity and demand for the keywords. For budgeting purposes, during your ad set-up you will select a maximum click amount that you are willing to pay for each click.